We swabbed common items in a typical family home to see where potentially harmful bacteria were lurking. We found faecal matter on the kettle, the kitchen bin and lots more besides. But how worrying is this, really? The presence of bugs in the home doesn’t mean they’re dangerous. Scroll down to see our video, which shows you how to use targeted hygiene to keep clean the areas that really matter. Not only will you save time on cleaning, but you’ll also make it more effective. We also explain what you can do to minimise the risk of illness and antibiotic resistance, what you need to know about the latest scientific investigations into antibacterial products, and why you wouldn’t want a home that’s free of bacteria altogether. Don’t let your bed become a haven for dust and bacteria. Find out how to clean a mattress. We took samples from 10 areas around an ordinary family house with two dogs and two teenagers, and sent them off to a lab for analysis. With the results, we were introduced to an array of microscopic organisms – some innocuous and some more suspect – which our experts tell us is exactly what we’d expect to see in a relatively clean home. While some of the results aren’t worrying, there are some bugs that can cause sickness, skin conditions and worse. 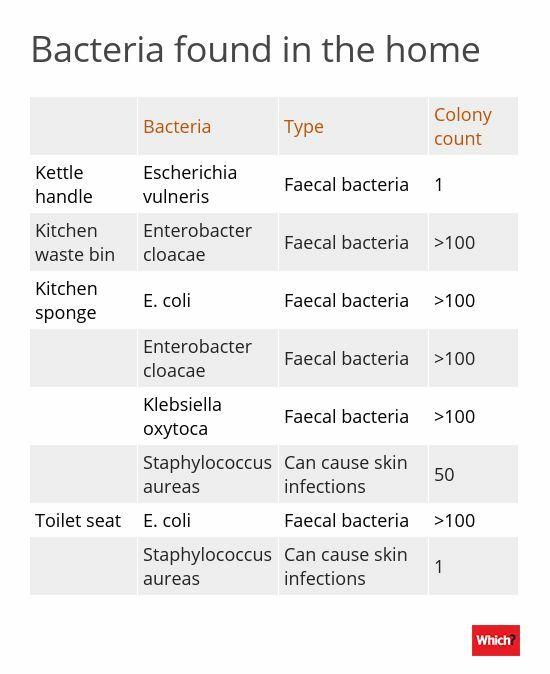 Of the less pleasant characters, we found three different types of faecal bacteria – including E.coli – on the kitchen sponge. This is the most contaminated item we found in the house and our experts say the same could be the case in most homes. There was also faecal matter on the kettle handle, kitchen bin and toilet seat. Staphylococcus, a bacteria that causes skin infections, was on the sponge and toilet. Keep reading to see our full results table. To clean effectively, concentrate on the ‘superhighways’ that spread pathogens around the home. So your hands, the surfaces you regularly touch (especially food prep areas) and anything that could spread bacteria, such as kitchen cloths or sponges. Pay particular attention to the kitchen and toilet. Also, make sure you dry worktops and chopping boards after cleaning; dampness helps bacteria survive and multiply. Be sure to wash your hands before food prep. 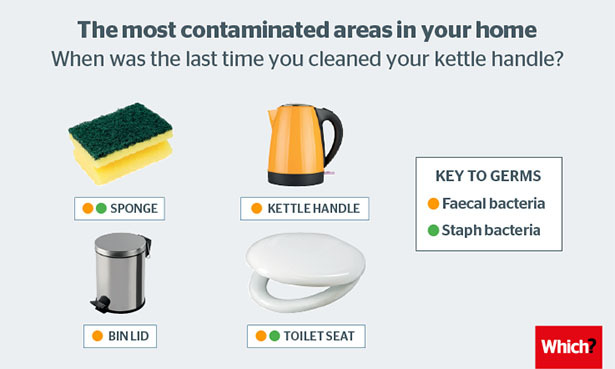 The idea of faeces on your kettle is enough to put you off your tea, but the discovery of a large amount of bacteria in the home shouldn’t be too shocking. The fact that bugs are in your home doesn’t mean they are a danger, and good hygiene is not about eliminating all bacteria. The key to keeping illnesses at bay is focusing on the culprits that spread pathogens around your home. 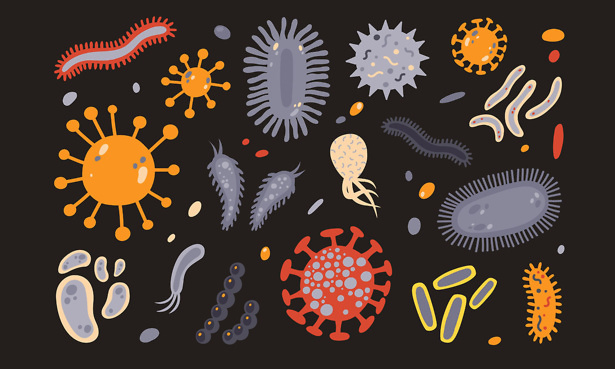 ‘Germs’ or ‘bugs’ are non-scientific terms generally used to refer to microscopic living organisms (or microbes) – bacteria and viruses in particular. These are single-cell organisms that can multiply on any surface, but grow more effectively in certain environments. Harmful types are responsible for conditions such as tissue infections and gastroenteritis. The majority are harmless to us, though, and some are even helpful. How long do they survive? Bacteria, such as salmonella and campylobacter, only survive for around one to four hours on hard surfaces or fabrics. The kitchen sponge is the perfect environment for bacterial growth as it’s warm, moist and harbours plenty of food. Viruses can only multiply within a living host and the majority do cause harm. They’re responsible for illnesses such as flu and colds. How long do they survive? Outside of the body, their lifespans differ hugely. Cold viruses don’t tend to live on surfaces for more than 24 hours. They last from a few minutes up to about an hour on your hands. Flu viruses can survive on hard surfaces for 24 hours, but on tissues for only 15 minutes. On your hands they lose much of their infective ability after five minutes, but can survive in the air for several hours. Norovirus, though, can survive for days or weeks on hard surfaces. In a nutshell: no. Good hygiene gets rid of the bad bacteria, not the good ones. Even the cleanest homes are teeming with microbes. It’s unrealistic to imagine that our household cleaning habits could produce a sterile environment, so the idea that we can be ‘too clean’ is inaccurate and potentially damaging. It’s true that on a societal level our immune systems are suffering from diminished exposure to beneficial organisms. But Graham Rook, professor of medical microbiology at University College London, says hygiene is not to blame. Rather, he explains, this is due to modern lifestyle factors: a diet high in processed foods, urbanisation and lack of exposure to the natural environment. Life events that can be unavoidable, such as caesarean birth and lack of breastfeeding, as well as antibiotics given during pregnancy or in early life are also influences. So we need to protect ourselves against infection while restoring contact with microbes that are important for our immune systems. 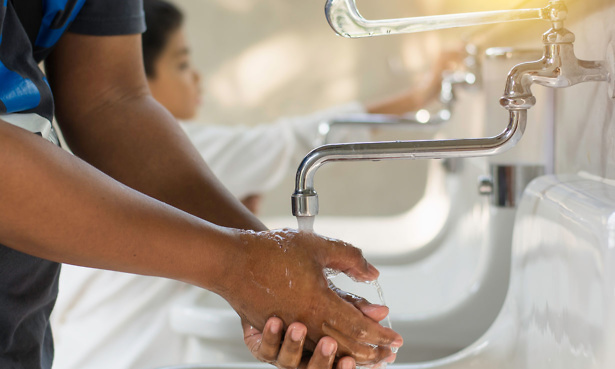 Good hygiene – particularly washing your hands properly – helps prevent the spread of harmful pathogens (such as salmonella) that make us ill, but doesn’t generally reduce our access to ‘good’ bacteria. For every person that gets ill as a result of bacterial infection that could have been prevented through hygiene, a burden is placed on the health service. For illnesses that require antibiotics, more antibiotic use means more resistance in the future. ‘Bacteria can build up antibiotic resistance after exposure to various disinfectant products in lab conditions, and there are some links between being resistant to some antibiotics and specific disinfectants. ‘For example, our research discovered that bacteria that have mutated to become resistant to quinolone antibiotics (commonly used in hospitals) also became more resistant to Triclosan, an antibacterial agent found in some soaps and cleaning products. Dr Webber continues: ‘The use of cleaning products marketed as antibacterial or antimicrobial has become widespread in recent years. Some of the active agents in these products have begun to accumulate in the environment and our water systems. ‘This raises concerns because lab studies show that bacteria can build up resistance to antibiotics after repeated exposure to various disinfectant products in lab conditions – although it’s still uncertain how this would translate to real-life conditions. Soap or detergent and water work fine for most things. If you’re washing dishes, you’re already washing bacteria down the drain – and adding disinfectant can harm the environment. On surfaces such as worktops, where you’re not rinsing away bacteria, disinfectant makes more sense. You need to wash surfaces with hot water and detergent before disinfecting them. The kitchen sponge is a hotspot for bacteria to breed and some may be potentially harmful. 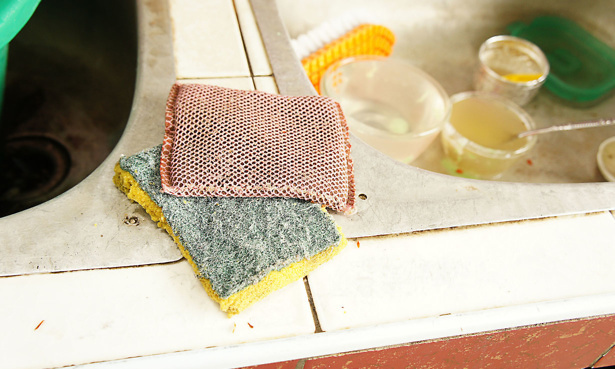 Using hot water and washing up liquid alone will not kill all the bacteria present in the sponge and microbes will cling to the fabric and multiply overnight by eating the microscopic food particles still within the sponge. You should put it in the dishwasher and wash on a high-temperature program or soak it in bleach overnight. This still won’t kill everything, but will hold germs at bay to some extent, and you should still replace sponges every week. Also, consider changing your tea towel every couple of days. When we tested some washing machines to see if they sustained a high enough temperature (60 degrees or more) for long enough to kill bacteria and fungi on clothes, we found that most didn’t. Get a washing machine that gives you top-class cleaning – we reveal our Best Buy washing machines. To kill germs you need to use a bleach or other disinfectant-based laundry detergent. 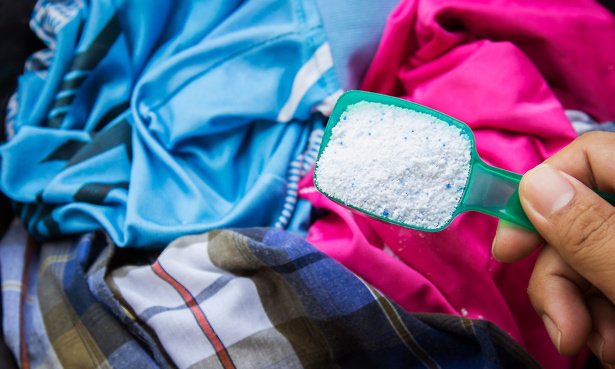 Liquid detergents don’t contain bleach, so you’ll need to choose a laundry powder that contains a bleaching agent. Biological powders tend to have more bleaching agents than non-biological powders. Bleach-based detergent is mostly needed for items that carry a high risk of contamination, such as towels used in the kitchen during food prep, sports clothes, underwear, socks or heavily soiled clothing, or for lower-risk items that come in close contact with the body, such as towels and bed linen. You should also run a regular empty hot wash once a month or so to help control mould and bacteria growth. 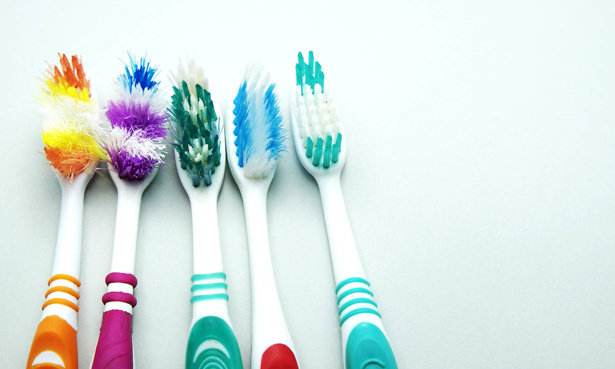 Dentists suggest that your toothbrush should be changed every three months or so. But you can sanitise it in between by either: running under a very hot tap for 30 seconds; soaking in antiseptic mouthwash overnight; sterilising in boiling water, or in the microwave or dishwasher. Treat your teeth to a Best Buy electric toothbrush. Natural cleaning products can be effective as they disrupt the environment bacteria needs to grow. 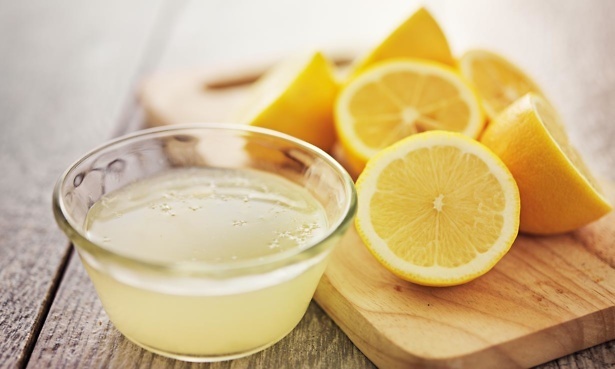 Vinegar and lemon are acidic, and will kill some, but not all, bacteria and viruses. Good cleaning is essentially about common sense, according to Dr Primrose Freestone, associate professor in clinical microbiology at the University of Leicester. She advises that good hygiene is very important but, in terms of how you clean your home, if you and you family are healthy and don’t suffer from stomach bugs or regular periods of being unwell, then you don’t need to worry too much about what you are currently doing. Professor at the London School of Hygiene & Tropical Medicine, Sally Bloomfield, says that targeted hygiene is key. Clean the right places at the right time, ie when there is higher risk of spreading infection. Professor Bloomfield emphasises the often-overlooked distinction between ‘cleanliness’ (the absence of dirt) and ‘hygiene’ (preventing the spread of infection) – the latter being the most important. 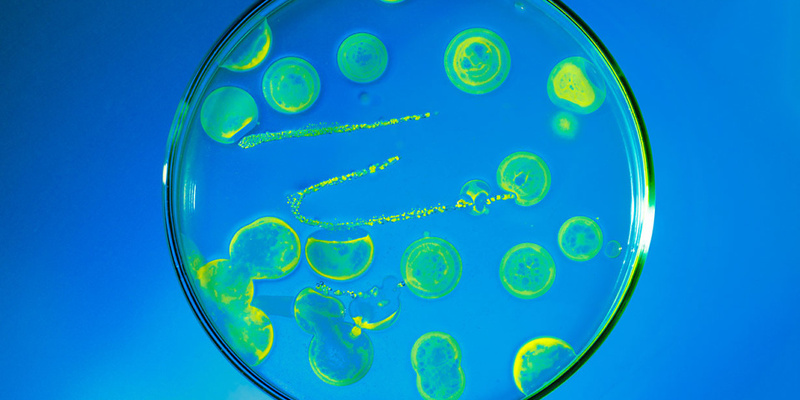 Trillions of microbes are essential to our health and wellbeing – they’re part of us. With this in mind, targeted hygiene is vital and the idea that we’re ‘too clean’ has been largely debunked. Hygiene practices should focus on preventing the spread of germs and need to be ramped up in certain circumstances: when someone is ill, if there’s a new baby in the home or if someone has a compromised immune system.